Dr. Paul Castagno named the recipient of the prestigious Oslo International Acting Festival 2018 Pedagogical Award, after an intensive week of workshops, debates, and presentations at KHiO (Oslo National Academy of Arts) in Oslo, Norway earlier this June. Dr. Castagno was the featured guest, serving on multiple panels and debates while also conducting a 7 day playwriting workshop with a group of international playwrights and actors—the workshop was enthusiastically received. While set at the leading theatre and arts academy in Norway, the festival included a diverse array of accomplished participants from across most European countries and the Middle East. The award takes into consideration the effort of the single teacher/author in pushing forward pedagogy and practice in the discipline of theatre. It is defined not as an outcome from work at the festival per se, but rather as a lifetime achievement award that acknowledges the impact of his sustained work over a number of years in the national and international arenas. Prior recipients have been widely recognized at the top of their field, thus, this impressive recognition as a world class pedagogue and scholar hailing from UNCW is most gratifying. Dr. Castagno states "While it is a career milestone for me, it also enhances UNCW’s reputation as a leader in the arts, globalization, and in pedagogical research." This year's festival's theme was polyvocal acting and Dr. Castagno was selected for the influential nature of his groundbreaking book, New Playwriting Strategies (2001; 2nd ed. 2012), and for other contributions and publications that advance the theory and practice of polyvocal playwriting and its corollary influence on acting approaches. Described as a “new poetics” his work has formed the basis for the EU Collective Play Project and is widely influential and cited in the pedagogy of contemporary playwriting across the world. For example, both editions have been translated into Persian and have sold out in Iran, where they were adopted by the major national universities. 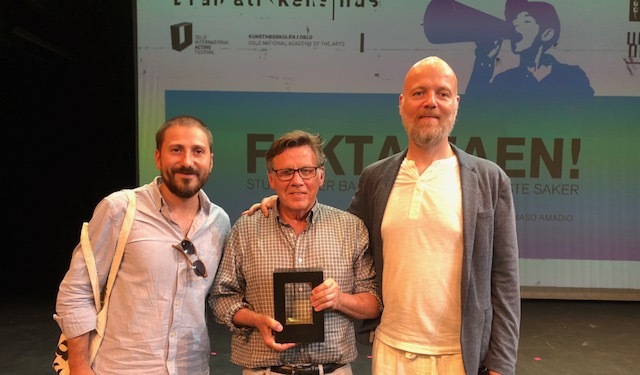 Dr. Castagno would like to thank the KHiO Festival coordinators, Gianluca Iumiento and Øystein Stene (pictured in photo) at KHiO who presented him with this great honor. He also truly appreciates the support of the Cahill, CAS travel award, and the UNCW Department of Theatre.